This great idea came from one of our loveliest of customers Mrs S.
Home-made kindle pine cones are a great idea to save from buying chemical fire lighters and a whole lot better for your family's health, and of course the environment. Dry pine cones burn very well and with the added oil and wax they make excellent fire starters and quite beautiful natural gifts. These natural fuellers are very easy to make. In preparation you need to collect fallen pine cones (some craft stores stock them) and keep all the wax from your old used candles (you can also by clean pelletted wax from many craft stores). 1) Prepare paper cases or grease proof muffin tins ready for setting wax. 2) Clean off any labels and pull out the remaining wick. 3) Melt your wax in a double boiler, adding essential oils for an extra room filling aroma when the pine cones burn. Lemongrass or Rose Geranium work well with the natural scent of pine. 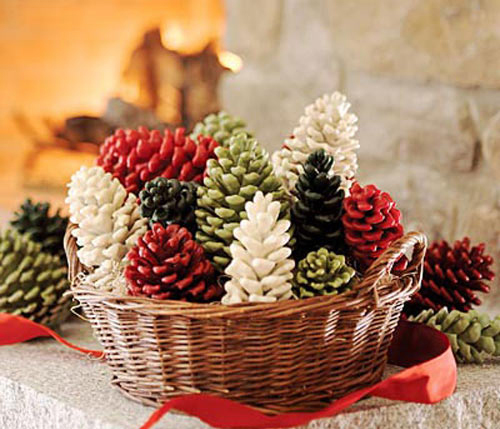 4) Dip the pine cones into the hot wax and place into paper cases. 5) Leave for 30 minutes or until set. 6) For a colourful flame roll tips of the scales of the pine cone in a little salt for a yellow flame, salt substitute for a violet flame and Epsom salts for white flames. 7) Place a few cones beneath and above kindling to help light your fire. The pine cone, depending on its size, should burn for up to 10 minutes. Some places charge up to £4 for wax coated pine cones but we think it's far prettier and a whole lot more eco-friendly to make our own - and it couldn't be easier if we tried! The first menstrual cup was created in the 1930s. As cynical as it may sound the business heads of the women's hygiene industry decided this waste-free, natural and convenient creation was not a sufficient money earner, so instead opted to promote the disposable alternatives of tampons and pads. But the menstrual cup is back by popular, eco-sensible demand. Lots of So Organic customers use the Mooncup. This little cup is made from soft silicone, which is derived from silica, a naturally occurring compound from the earth. Some people worry of exposure to pesticides, chemicals or bleaches when using tampons or pads but the Mooncup menstrual cup contains none of these. Non-organic cotton accounts for a quarter of the world's pesticide use. As one of the main ingredients in tampons this is a scary thought. Organic tampons are great though do still absorb (in addition to menstrual fluid) the natural moisture that maintains a healthy vaginal environment. The menstrual cup does not absorb; it only collects flowing blood. By reusing the menstrual cup every month you contribute fewer tampons to the sewerage system and less pads to landfill. Plus think of the energy required to source, manufacture and transport the material used in what is estimated to be around 10,000 tampons and pads in one woman's lifetime. 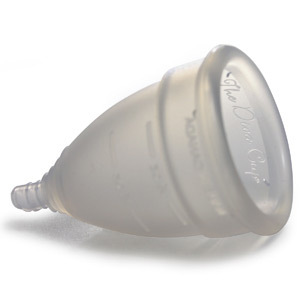 The menstrual cup is a perfect little sanitary device. You save your body from unnatural substances, you save money and you save the environment all at the same time! Autumn is on its way; time to snuggle up and get cosy, and what better way than with a gorgeous new set of silk bedding? Silk Duvet Review: "I have slept under a long fibre mulberry silk filled duvet for the last 6-7 years. It is feather light and drapes beautifully keeping me wrapped in comfort all night long. It is warm in winter, cool in summer and is very breathable allowing me and my husband to both feel comfortable. Even though with regular duvets we prefer different weights, we both love our 9 tog silk filled duvet and use it all year round. When staying away from home no other duvet ever comes close, even when staying at good hotels we always can’t wait to get home to the comfort of our silk filled duvet! Unfortunately the company we used to get our Silk Duvets from is no longer around. I am so happy to have found Natalie and Snow Blossom to be able to once again offer our customers the joy and comfort of sleeping under silk. The quality of the Snow Blossom products is the best I’ve ever seen." "Having picked up so much useful information from The lady over the years I would like to share a fairly recent experience with bamboo fibre which may be of help to other ‘hot headed and unable to sleep’ individuals when a heat wave descends. I had never heard of bedding containing bamboo before coming across a luxurious bedding stall at one of the country shows. Just touching a sample pillowcase made of this fibre was very intriguing. It seemed to take away all heat from my hand. Sleeping all night in a heat wave does not diminish this curious phenomenon and both hubby and I awake not at all grumpy! Panda lovers need not worry, as it is not the same genus of bamboo that the dear creatures like to eat – it is harvested especially for fibre production. I did ask that question as there has been so much fuss and worry about panda feeding habitats. The company is called Snow Blossom and as far as I know their products are not available in stores." Happily Snow Blossom bamboo bedding and silk filled duvets and pillows are now available here at So Organic. If you need some advice in choosing, please call our product specialists on 020 8465 5600, they'd love to help. 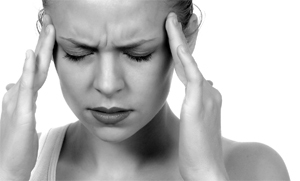 Dealing with Migraines – Organically! As a long time sufferer I know that often pills are not the answer to Migraine pain nor do I want to be regularly taking pain killers for something that though horrible painful and inconvenient is not life threatening. The causes of migraines vary from person to person and suffers can learn their triggers and avoid them up to a point. However there are those caused by hormonal changes, stress and tiredness which are much more difficult to avoid in everyday life. Working at So Organic means that I have been able to talk to a lot of our holistic therapists who practice in our Therapy Rooms to get their advice. Matthew Reay our Nutritionist advised me to cut down on carbohydrates and to eat lots of magnesium rich foods such a spinach and nuts, I now try to eat a portion of unsalted nuts per day and eat spinach as much as possible while avoiding eating carbs with my evening meal, instead having lots of vegetable alternatives such as mashed cauliflower instead of potatoes. I’ve really noticed a difference in the regularity of my migraines after making these dietary changes. Our old Massage therapist Kristy taught me some gentle moves to also help such as using both hands and very gently kneading the top of the head, working down the neck and across the shoulders and back up again, this is very soothing and helps distract from the pain. We have a new Massage Therapist now since Kristy emigrated so I will be asking Mike what his tips are. Lyndsay Brown our Body Talk therapists helped me understand that my body was trying to tell me something when a Migraine occurred and that often it was because I wasn’t drinking enough water throughout the day, therefore I’ve increased my water intake as well. As all Migraine suffers know there isn’t a magically solution to stop Migraines but using the both I have at least managed to decrease the amount I suffer from without increasing my amount of medicine! The phrase, “A voice crying in the wilderness” made us think of a message that needs to be heard. One of the most remote wildernesses on earth is the Arctic Circle home to the polar bear. Man’s consumption of ever increasing amounts of fossil fuels mean that we are now making the polar bear share his home with us as we move in to mine oil and coal. Polar bears now have a smaller area in which to hunt which means food is harder to find and oil spills and manmade pollution cause danger to polar bears by poisoning their food source and coating their fur so that they can’t keep warm. We think that if polar bears could talk to us they would ask us to stop spoiling their home and hurting them with our selfish ways. We believe that we listen to the voice of nature, minimise our impact on the earth and conserve its precious resources and habitats by being green wherever we can. 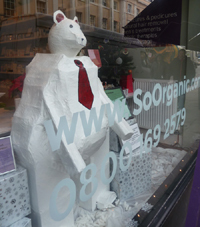 To help convey that message we have made our polar bear from entirely recycled materials that would otherwise have been thrown away.